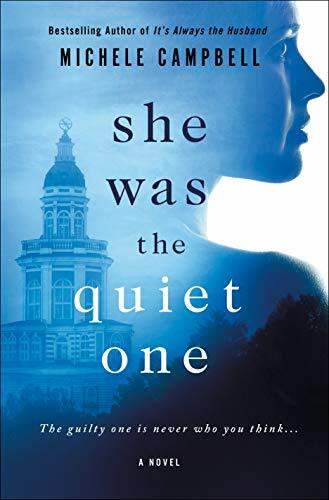 Michele Campbell’s thriller She was the Quiet One has all the ingredients of a perfect summer beach read. A follow-up to her bestselling It’s Always the Husband, her newest novel is best read by daylight because Ms. Campbell has set her gothic murder mystery within the confines of a northern New England boarding school, a place heavily laden with dark woods, atmospheric fog, and a sense of isolation from the rest of the world. A brilliant touch is the way in which Campbell, while revealing in the first pages of the novel that someone has been murdered, withholds the identity of the victim for much of the novel. Who’s dead? Is it Bel Enright, the beautiful, wild, risk-taking sister? Or is it her more careful, studious, care-taking sister Rose who falls victim? And who is the killer? Is it the other twin? Is it the senior queen bee hottie Darcy Madden? The manipulative Zach Cuddy, in love with one or both of the twins? Maybe it’s the grandmother’s gold-digging lawyer friend, Warren Adams? Could it be the faculty heart throb, Heath Donovan? Might it be the brutish Brandon Flynn? Motives and opportunities to perpetrate the crime abound. Though the novel sometimes pushes the limits of credulity, it succeeds because Campbell creates several distinct and interesting characters. The Enright sisters are well defined, and their love-hate relationship resonates as typical for 15-year-old high school sisters. Heath Donovan is brilliantly drawn: handsome, brilliant, smooth, the dutiful husband and father, but a man with a past. His wife Sarah presents as the typical boarding school wife, teacher, and mother. Her plainness and sometimes naïve acceptance of his often unlikely explanations of things serves as a foil to the complex character of her husband. She was the Quiet One is not your idealized picture of the bucolic boarding schools we saw in Good-bye Mr. Chips or To Serve Them All Our Days. Nor does it match the literary depth of Catcher in the Rye or A Separate Peace. It’s more out of the tradition of James Kirkwood’s dark Good Times/Bad Times. But then Campbell might tell you she wasn’t trying to create a literary masterpiece, that using the boarding school locale provided the ideal setting for the action of this intense murder mystery. She had a story to tell, and it’s well-conceived, brilliantly constructed, scary as the nightlights, and thoroughly engrossing. John Newlin's fiction reviews have appeared in such online literary journals as Night Owl and South 85. He was an English teacher for many years with articles published in Independent School.